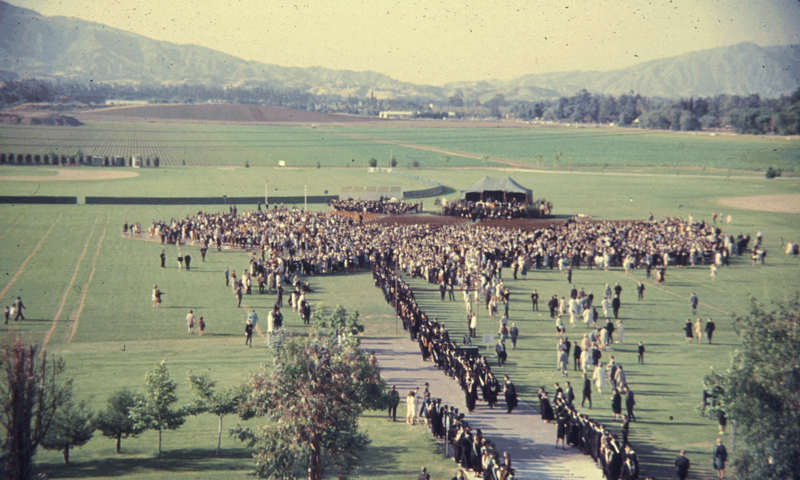 (Bonnie) My father, Ted Ovrid, started working here in 1961 when it was the San Fernando Valley State College, and he was employed here until 1989 when he retired after 26 years of service. He was the PPM [Physical Plant Management] Material Fabrication Specialist Supervisor, and in 1983 he constructed the time capsule for the CSUN 25th anniversary, which has been opened now for the 50th anniversary. 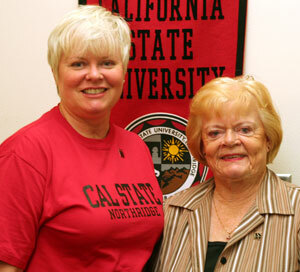 I would like to add that one of the reasons I am employed here: my father had already retired, but his experience here was a very good experience, and he was very proud to be contributing to CSUN. And so when I was looking for places to be employed I gave some thought to the type of environment that I wanted to be in, and so I applied here and fortunately they did hire me and I am very proud now to be employed in the President’s office and really be contributing to the campus today. 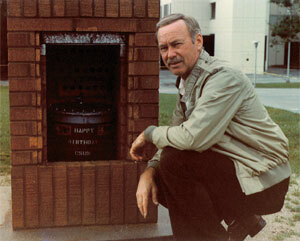 Ted Ovrid with the CSUN 25th anniversary time capsule, 1983. (Claire) That’s 25 years ago, and I remember that he was very excited about being involved in that project. There was a ceremony when they actually were presenting the time capsule, where it was going to be buried, and so forth and so on, and I was there at that little ceremony. And then he [Ted] was the last person to see the time capsule, because he sealed it and buried it. There was a $25 charge for anyone that wanted to put something personal into the time capsule. $25, 25 years ago was more than it is today — we spend that to go out for dinner now. And I said to him, “You know you’re going to be the last one to see this time capsule, you’re going to close it up, you know couldn’t you just slip something in from our family, like a little photo or something?” And he said, “Oh, no — people that are putting personal things in have to pay the $25. So now I was quite interested with the opening of this time capsule, if in fact he did put something in; but we have spoken to the young man that had opened it and has the contents and it seems like my husband Ted Ovrid did not give in to his wife’s wishes. It seemed like he was going to follow the rules. And that is really in keeping with my husband’s character. In his mind, that wouldn’t have been fair. Other people had to pay $25 to put personal items in. And even though he could do it without anybody looking, he would be honorable.